What is Akhilesh trying to achieve? Can Mulayam ever become PM? Uttar Pradesh Chief Minister Akhilesh Yadav has offered the Congress an alliance formula for the next Lok Sabha elections. 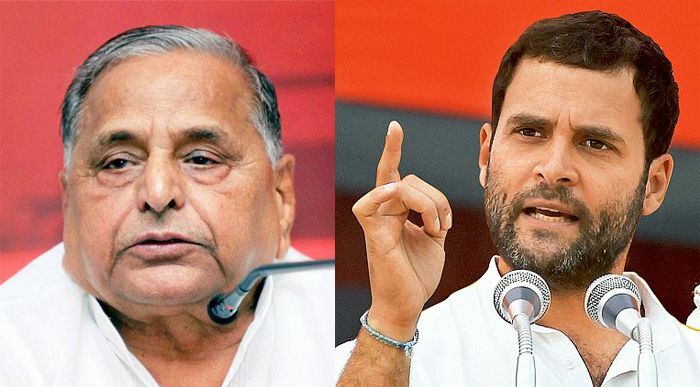 "If Mulayam Singhji is Prime Minister and Rahul Gandhi is Deputy Prime Minister, I will say yes to the alliance right now," said Yadav said, speaking at the HT Leadership Summit on Friday. The Congress vice-president, who was present in the audience, smiled at the offer but said nothing. And perhaps nothing will ever be said about this "alliance" simply because it just won't happen. It is based on two assumptions: first, that the Narendra Modi's BJP will be defeated in the 2019 Lok Sabha elections and second, that the Congress will not be in a position to have one of its leaders as the Prime Minister. It is too early to make both these assumptions. But even if the BJP loses and the Congress is forced to back a non-Congress PM, Mulayam Singh Yadav will probably the last person to be considered for the job. Here's why. Even speculation of Modi's defeat in 2019 wouldn't have been possible without the Mahagathbandhan's victory in the Bihar Assembly elections. It is this triumph of the JD(U)-RJD-Congress alliance proved that united Opposition can turn the tables on the BJP's electoral machinery. And who tried to sabotage the Mahagathbandhan's chances during the elections? Mulayam. He joined the alliance to begin with, only to quit it later and put up candidates against the Mahagathbandhan. The reason he cited for quitting was, among other things, the presence of the Congress' in the alliance. So now asking not just the Congress but other non-BJP parties like the JD(U) and RJD to back Mulayam as PM is a bit rich. In fact, now given the Mahagathbandhan's success, the most appropriate Third Front candidate for PM would be Nitish Kumar. It appears that offering an olive branch to the Congress, was Akhilesh's way of getting the SP back into the good books the larger national Opposition. As anti-BJPism lies at the very core of the SP's politics, it just cannot afford to be seen as having aided the saffron party in Bihar. If the Bihar betrayal isn't enough, go back to 1998. The Atal Bihari Vajpayee government had fallen after losing the vote of confidence by one vote. The Congress, under Sonia Gandhi, was all set to form the government. It even went to the President claiming that it had the numbers to stake claim. But the entire exercise was nixed at the last moment by Mulayam, who refused to support the coalition. Of course, Congress-SP relations improved in the years to come. The party played a critical role in bailing the UPA out during the Indo-US nuclear deal vote in Parliament in 2008. But many believe that Sonia Gandhi never quite forgot Mulayam's 1998 betrayal. One does feel bad for Akhilesh though. It seems that he was just being a good son by trying to fulfill his father's long cherished dream of becoming the Prime Minister of India. Mulayam was the front runner to become prime minister in the United Front government in 1996 but his prospects were apparently scuttled by fellow Yadav chieftain Lalu Prasad. Even in 2012 when the SP won an overwhelming majority in Uttar Pradesh, Mulayam gave the chief ministership to his son and chose to focus on national politics, perhaps with the same aim mind. But the SP came a cropper in the 2014 elections, with only Mulayam and his family members managing to win their seats. And now with the political landscape becoming increasingly bipolar, the SP chief cannot do without the Congress' support. The best way for Mulayam to emerge as a possible PM candidate would have been through the Janata Parivar experiment. As the senior-most among the motley group of leaders, he would certainly have been the president of the party had it come into being. However, the Janata Parivar proved to be a non-starter. Mulayam has no one but himself to blame for the plight he is in. Akhilesh still has a little over a year to go as CM of UP. He would do well to make these months count and revive the SP's fortunes. Without a good performance in UP, Mulayam's prime ministerial dream might remain a dream, despite Akhilesh's best intentions. Arvind Kejriwal has a question for PM Modi: How does he manage with his meagre salary?